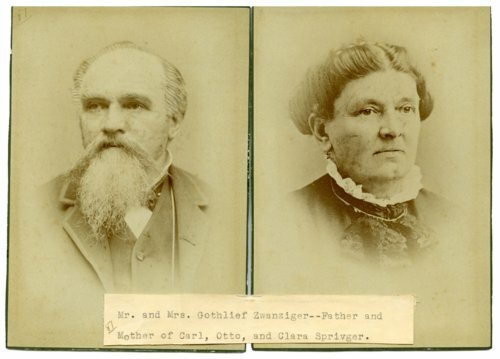 These are two joined studio portraits of Gottlieb Zwanziger and his wife, Theresa. Zwanziger was the founder of the Alma Town Company and was also the surveyor who mapped the first streets in Alma, Kansas. Zwanziger also constructed the first flour mill on Mill Creek, being one of the earliest settlers in the county.